RF circulator PE8422 from Pasternack is part of our extensive in-stock RF, microwave and millimeter wave components available for purchase. 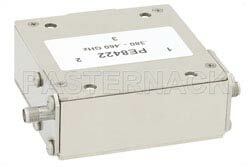 This RF circulator is manufactured with SMA connectors that are female. Our SMA circulator has a minimum frequency of 380 MHz and a maximum frequency of 460 MHz. This SMA coaxial circulator has a minimum isolation of 20 dB and a maximum input power of 1000 Watts. 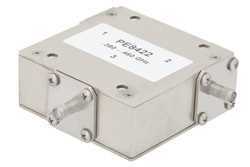 PE8422 coaxial SMA circulator is one of over 40,000 RF, microwave and millimeter wave components supplied by Pasternack. Our radio frequency circulator can be bought and shipped worldwide the same-day as with our other in-stock RF parts.